Artists use a variety of references when creating their art. They find inspiration in situations and landscapes, people, animals, places, ideas, and more. Few of these muses are packaged the same way. 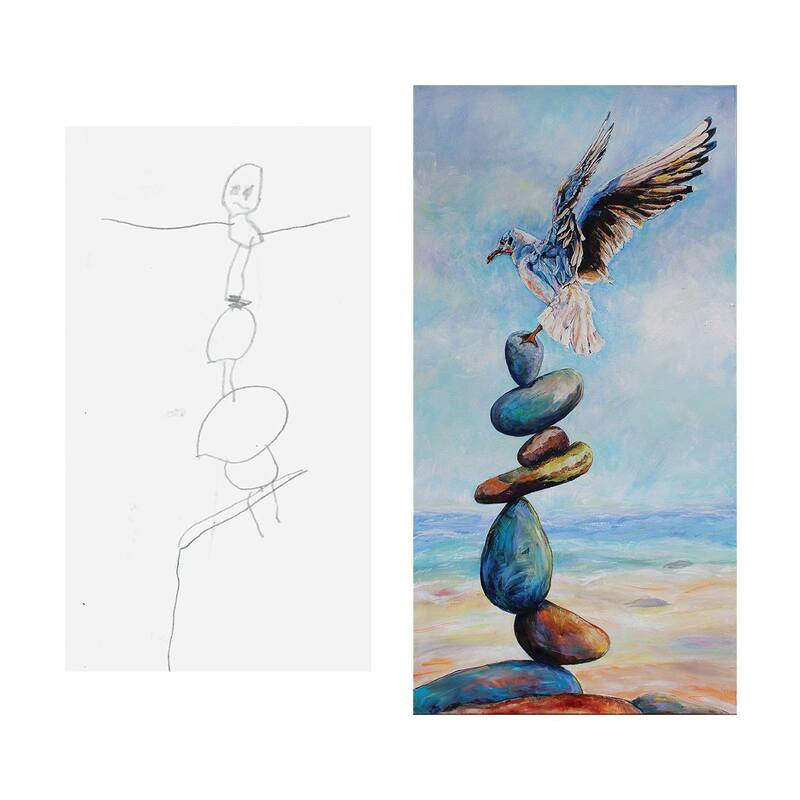 For sure, the artwork created for the REIMAGINE exhibit currently on display at the Lexington, Kentucky Pam Miller Downtown Arts Center is built upon a less typical reference; it is inspired by children’s drawings. 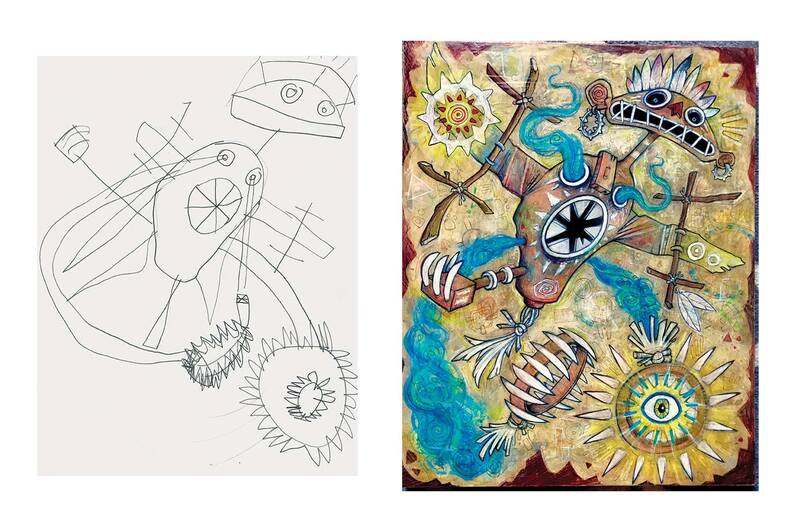 In the REIMAGINE exhibit, the artists have chosen a local child’s drawing, one that inspired them, then REIMAGINED the drawing in their own style and medium. “It is incredible to see the two pieces side-by-side in this exhibit,” says Donna Hutton, Preschool Director at The Lexington School where Lori Barnett, developer of REIMAGINE teaches art. You have to see it to understand, but child art is a look into the bright and innocent mind of creativity. To connect the adult artist to the childlike imagination and see what grows from that experience is inspiration for all, including the art enthusiast. Big thanks and congratulations to Lori Barnett, developer of the REIMAGINE exhibit. Lori developed the concept years ago, and even now that she teaches art to preschool through second graders full-time at The Lexington School, she manages to continue her work with this amazing exhibit, which connects local artists with public and private schools and creative children in Fayette and surrounding counties. 6 local schools and 31 artists are represented, including NINE child artists from The Lexington School. Adding another layer of benefit to this unique exhibit is philanthropy. The exhibit is free and open to the public, and the artists’ works are auctioned off (bidding is open now). Proceeds from the auction raise funds for local public school art programs in Fayette and surrounding counties. Currently on display at the Downtown Arts Center, the exhibit is part of Gallery Hop on September 21 from 5:00 P.M. to 8:00 P.M. when final bidding will take place. The exhibit is open from August 10-September 30. REIMAGINE is inspiration for all. It is a must-see.